Don't be fooled by this quick fudge recipe. It may take only 15 minutes to prepare, but underneath the holiday sprinkles lies seriously chocolaty, supremely creamy perfection. 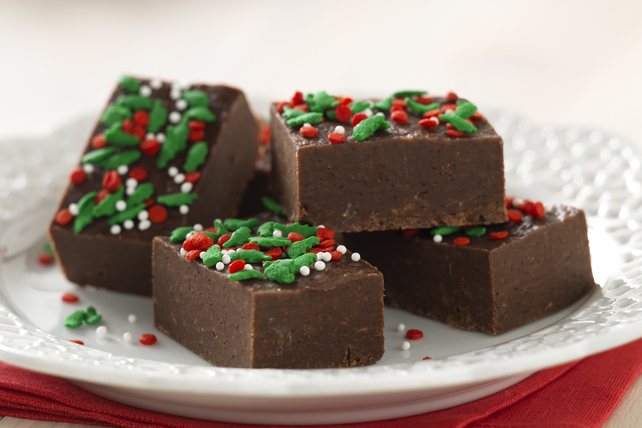 Just the kind of fudge recipe you need for holiday entertaining and gift-giving. Add dry pudding mix; stir with whisk 2 min. Add sugar, 1 cup at a time, stirring after each addition until blended; press onto bottom of prepared pan. Top with sprinkles; press into fudge to secure. Try our delicious Peanut Butter Fudge Bites and Confetti Fudge recipes.